From New York to Arizona, criminals armed with weapons equipped with large-capacity ammunition magazines have gone on numerous shooting sprees causing mass fatalities across the United States. These incidents, and related carnage, have increased significantly since the federal ban on these magazines was lifted in 2004. When ammunition magazines are available in large sizes—capable of holding as many as 100 rounds of ammunition—the lethality of these attacks is significantly increased. For instance, in the January, 2011 Tucson, AZ shooting, the perpetrator was equipped with a large-capacity ammunition magazine, allowing the gunman to fire off more than 30 bullets in 15 seconds-killing six and wounding 13 others, including Rep. Gabrielle Giffords. Similar scenarios played out in the tragic Newtown, CT and Aurora, CO shootings. These attacks were similar to the December 1993 Long Island Railroad shooting spree. In these incidents, individuals acquired semiautomatic weapons along with large-capacity ammunition magazines. In the aftermath of the LIRR shooting, President Clinton called for tighter gun controls, and in nine months, Congress imposed the ban on large-capacity magazines and assault weapons. The federal law banning the sale of large-capacity magazines and semiautomatic assault weapons, commonly known as the federal assault weapons ban, was passed as part of the Violent Crime Control and Law Enforcement Act of 1994. President Clinton signed it into law on September 13, 1994. Under this law, ammunition magazines were limited to 10 rounds for civilian ownership. This ban had a 10-year sunset provision. In September 2004, Congress and President George W. Bush took no action to renew the ban-allowing civilians once again to lawfully purchase these dangerous weapons. The result has been deadly for Americans. As our research shows, in the decade before the ban, more than twice as many people were killed or injured by shooters using a large-capacity magazine than in the decade during the ban. In the decade since its expiration, casualties have nearly tripled. Large-capacity magazines carry far more bullets than any civilian could possibly ever use. Restricting an average citizen's ability to load more than 10 bullets is common sense. A ban on large-capacity magazines would not only reduce the capacity, but more importantly reduce the lethality of firearms. Congress needs to learn the obvious lesson from this horrible tragedy and renew the ban on large-capacity magazines now. Mass shootings have taken place consistently throughout American history, in every region of the country. Over the last 30 years, however, assault weapons and large-capacity ammunition magazines—which hold more than 10 rounds—have proliferated, allowing assailants to become much more destructive. A new Crime Commission analysis shows, the results have been deadly for Americans. It's time to reinstitute the federal ban on large-capacity ammunition magazines. What is an ammunition magazine? An ammunition magazine is the feeding device that contains the ammunition used by a firearm, including automatic and semiautomatic weapons. The magazine may be detachable or internal. What is the difference between an automatic and a semiautomatic firearm? Automatic firearms continuously fire rounds until the trigger is released or the magazine is emptied. Semiautomatic firearms shoot one round per single pull of the trigger. The firearm used by Jared Loughner during the Arizona shooting was a semiautomatic handgun equipped with a large-capacity magazine. He fired more than 30 rounds in 15 seconds. What is the difference between an ammunition magazine and an ammunition clip? An ammunition magazine and an ammunition clip are two different devices. A clip is a device that holds several bullets together, allowing ammunition to be quickly loaded into a magazine. 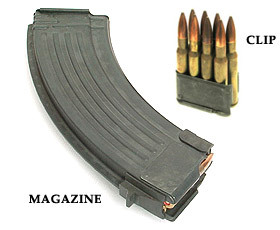 The major difference between a magazine and a clip is a magazine has a feeding mechanism (such as a spring) used to move a round into the gun. Although incorrect, the two terms are often used interchangeably. How many rounds qualify a magazine as large-capacity? Ammunition magazines that hold more than 10 rounds at a time are generally considered to be large-capacity.